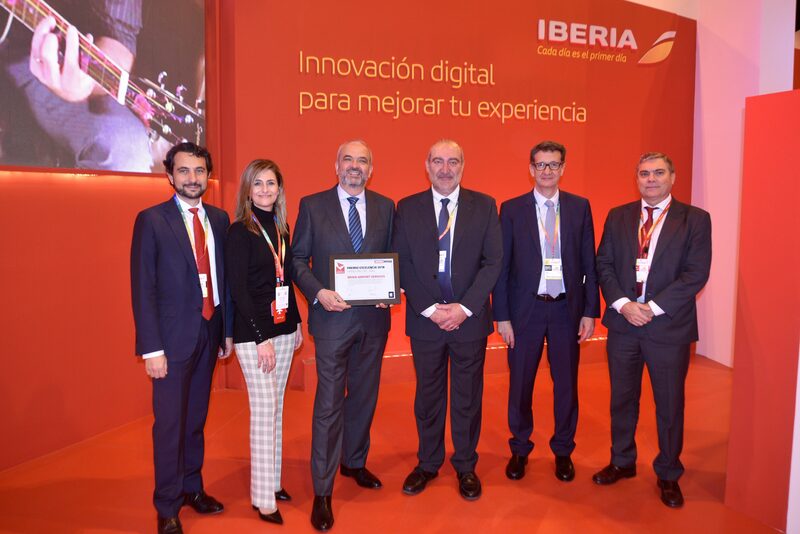 Iberia Airport Services has received the ARI Award for Excellence in the aeronautical sector awarded by the magazine Avion Revue International. These awards recognize companies that stand out during the year for their achievements, developments, introduction of significant advances and / or excellent performance in their sector. The director of this publication, reference in our market, Jorge Peñalba, delivered a commemorative diploma to our Director of Airport Services, Ángel Marcos, who was accompanied by his entire leadership team. The delivery took place at the Iberia stand in FITUR, the major Spanish Tourism event. This award is granted for the efforts of Iberia Airport Services to preserve the environment by steadily renewing our fleet of GSE with more ecological units, for applying the latest technologies in our different areas (ramp, passenger attention, coordination) and for introducing digitized systems at all the airports where we operate. Avion Revue, since its creation in 1982, covers all the news of the aviation world both nationally and internationally, with presence in Spain and Latin America. ARI Awards for Excellence are granted annually by the editorial staff of the magazine to reward excellent performance in the sector.